Bows and Arrows for Boys, George C. Decker, 1930.—Making the Bowstring. Part 1 of 5. The finest material to be had today for bowstrings is Barbour's No. 3, Best Irish Flax, thread, which is very strong and will actually stand a test of 1 pound pull to a single strand. Barbour's thread can be obtained from any shoemaker or leather worker in the form of balls or spools. Each ball will contain enough thread for about five bow­strings. To aid in quickly making a bowstring, a simple board with nails or small screws in it is a distinct advantage in order to get the proper taper for the loop at the end. The other end of the string is plain and tied securely with a timber hitch. For the string board, select a piece of any material about ¾ inch thick, 1¾ inches wide, and 3 feet 8 inches long. Lay off 1-inch spaces across the face of the board at one end; place parallel rows of 1-inch brads or round-head screws on these lines, inch on either side of the center line. (See Fig. 14.) 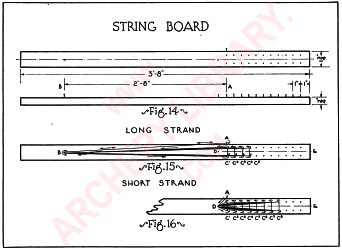 Then there must be a brad, or screw, at point A, on the edge of the board which is the beginning point in laying out of the various strands that make up the completed string. At point B, place another brad, or screw—this point is variable and de­pends upon the length of the bowstring to be made. The dimension 2 feet 8 inches, as given in Figure 14, is about right for a 5-foot bow. Usually, about 6 or 7 inches of the original thread length is taken up later in twisting and the tying of the timber hitch. A brad, or screw, is placed at point D also, and will be used in the making of reenforce­ment strands. All of these brads, or screws, should project from the board about inch. They form points about which to wind the thread in laying out the various parts of the bowstring. This device does not take long to make and will save much time in the making of future bowstrings. An archer usually carries one or more extra strings at all times for his bow. When one string becomes worn or shows signs of weakening, it should be replaced with a new one.